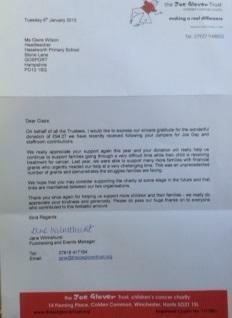 Thank you to everyone, families and staff, who donated money to The Joe Glover Trust. We had a Christmas Jumper day when we had our school Christmas lunch and many people brought in a donation. Staff also decided to donate to the charity instead of sending each other Christmas cards. In total, we raised £94.27. Well done and thank you to all involved.